These days you can find fruits and vegetables in the supermarket or fruit and vegetable shop year round, regardless of whether they're in season or not. But whilst this is convenient, it may not be the best choice. Health experts and chefs are always talking about "eating seasonally" - but what does it all mean - and why should you eat seasonally? Eating seasonally carries benefits for your health, the community, the environment and your wallet. When purchasing in-season fruits and vegetables, you're more likely to be purchasing fresher produce. Fresh is best both nutritionally and taste-wise! When buying food that's in season, you're buying it at the peak of its supply - and that usually means it's cheaper to purchase. Whilst this isn't the case for all produce (it really depends where you buy it and what you're buying), buying seasonal produce gives you the opportunity to support local growers and farmers. For example, you can buy cherries year round in Coles and Woolworths - but during winter when cherries aren't in season in Australia, you'll be buying imported cherries from the US - meaning the sales profits go overseas and not to local farmers. If you buy cherries in season, even from the supermarket, you'll be supporting Australian farmers. 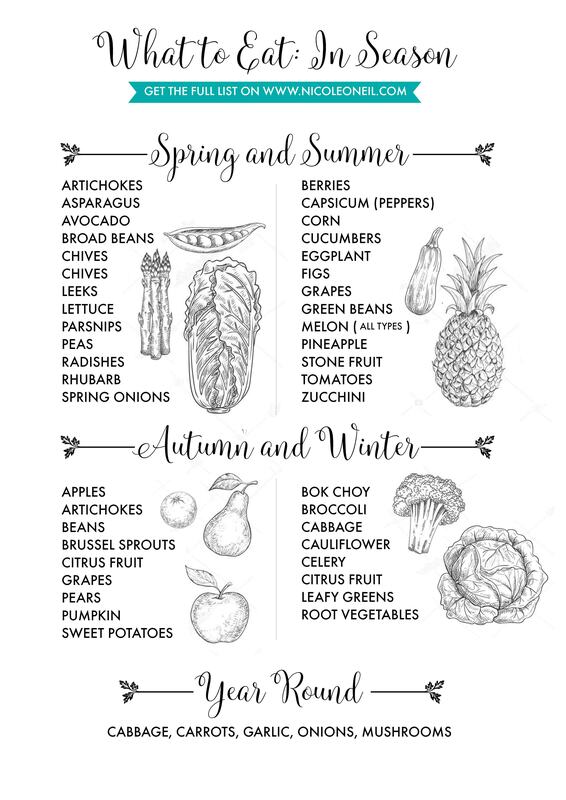 Get my Free Seasonal Eating Printable to stick on your fridge - or see the full list below!